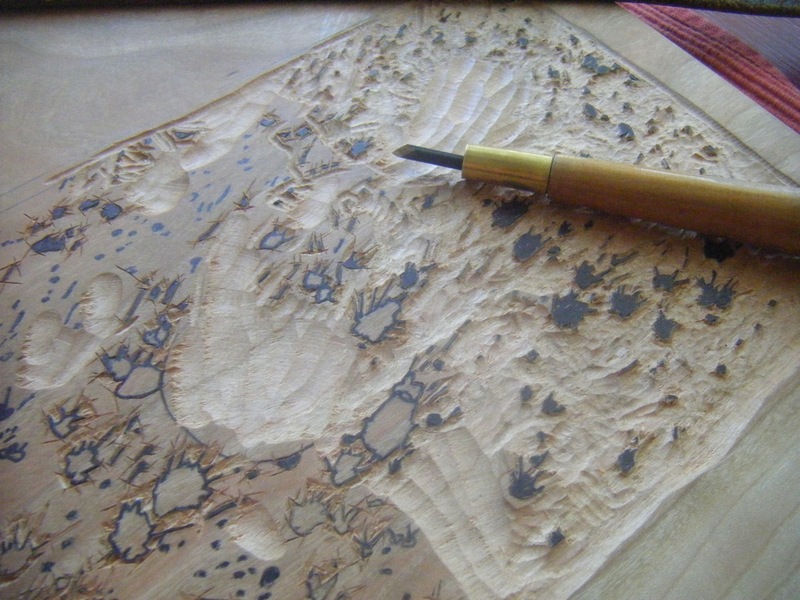 Proofing my cherry wood spatter block. Changes in plans meant that I had to throw all of my blocks, tools, cut paper and barens/and brushes into a suitcase as I had to change continents all of a sudden. I'd hoped to wrap up this "simple" print before leaving but I had to leave a week early and the week I'd left for printing didn't happen. Sadly, my suitcase was way overweight (art supplies, Halloween candy and tortillas) so I had to jettison the oak block that started this whole thing...so I'll have to make due with some careful printing to get some of the depth and drama I was after. Work commitments will keep me in Santa Cruz, until December but for a few weeks, I'm back in Italy and trying to finish up an art project that is due Nov. 1. This will be a portion of one of the blocks that will make up an exchange print for Baren Forum's exchange # 54. It's a friendly exchange of works by relief printmakers that happens 4 times a year. Sometimes there's a theme/sometimes a size/sometimes a "technique challenge". No theme this time; the only restrictions are the size: (5.7" x 13") and a technique...moku hanga--all the participants this time around have to use the Japanese woodblock printing method (wood blocks, Japanese paper, brushed-on water-based inks and printing with a baren (or wooden spoon). Not sure I'll make the deadline as if I have to ship the prints from here they'll take longer but I'm back on track after the jet lag wore off and my cold is finally waning. This block printed just fine, the graininess is from the fact that it's on etching paper and not my good Japanese paper. I'm proofing the other blocks today. 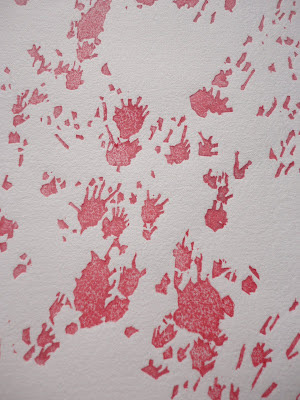 I'll be printing on a new paper, Kizuki Kozo from the Japanese Paper Place in Ontario, Canada. A bit risky trying a new paper on a moku-hanga print, but I like surprises; it might be too soft, too lightly-sized, too light, too anything...If I'm lucky, I should be able to adjust the final print to all of these variables.... I hope to start printing tomorrow if no new hurdles present themselves. Well a lazy Saturday spent mostly at home. I have the day off, and a bit of a cold, so I stayed in most of the day and worked away at the splotches I wanted to try and carve for the background block. Here's a close up of the cherry block before I spent the day pecking away. I'm using the sharp pointed Toh chisel to outline the shapes. Then I use a couple of bull-nose or Aisuki chisels to clear away everything else. The toh make a kind of stop-cut that allows me to clear right to the edge. Hope to finish it tonight or tomorrow. The other 1-2 blocks are soft Shina plywood and should go fast. Work on this little print progresses slowly. I have two blocks carved but I think I'll need a little more drama than the oak grain from my last post might provide once I get to printing so I decided to try a different approach. 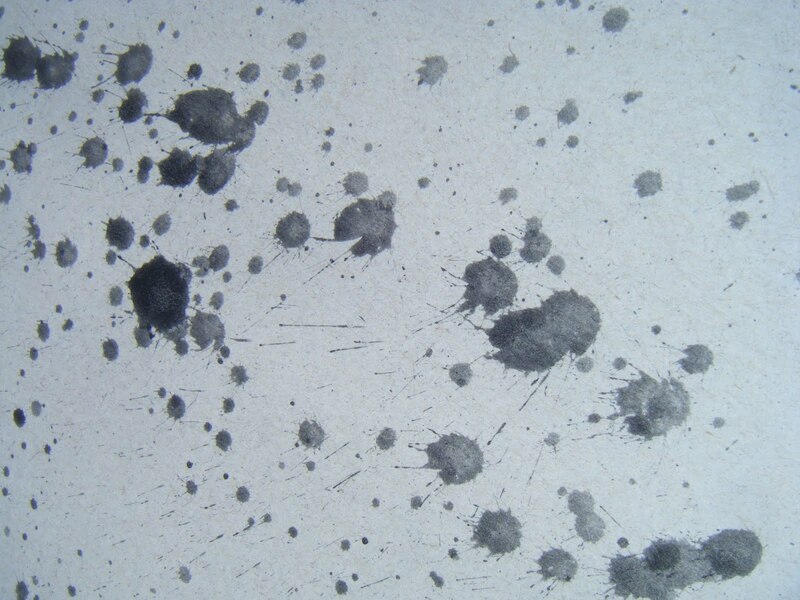 I mixed a little sumi with a little water and with a big, old housepainting brush I splashed and spattered the ink on several pieces of cardboard and paper. 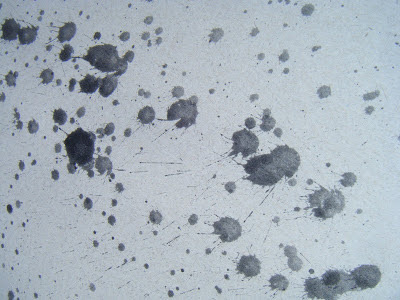 Once I was happy with the variety of splashes, drops, drips and scatter, I let it dry then traced it onto .03mm acetate using a pen with a fine nib. 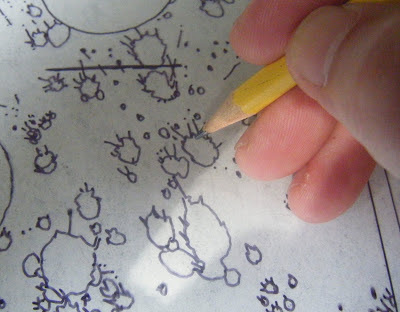 Then I transferred it onto the block using carbon/transfer paper using a sharpened pencil. This is going onto a cherry block as I want to retain some of the detail of the little droplets. I started carving this tonight and it is going slowly. I need to sharpen my tools since the hardness of the wood I can't really influence. But sharper gouges and aisuki chisels will make things much easier. I'll try to post a photo tomorrow of the block. I am trying however to keep the subject a mystery until I finish the print. So the photos will be cropped oddly to prevent guessing. It's been a long time since I've gotten any work done. But sometimes, the best way to begin is just to start working. Here I am; sanding block and wood board on my lap. I do this by hand; it's slow and meditative and gets me to think about the wood and begin to feel about where I want to go. I've got a preliminary sketch worked out but this time, instead of a detailed finished drawing to paste down; I'm going to be using a tracing on acetate and carbon paper to transfer the shapes to the blocks. While most of the blocks will be Shina--a Japanese linden plywood, I wanted one block that would add some drama. 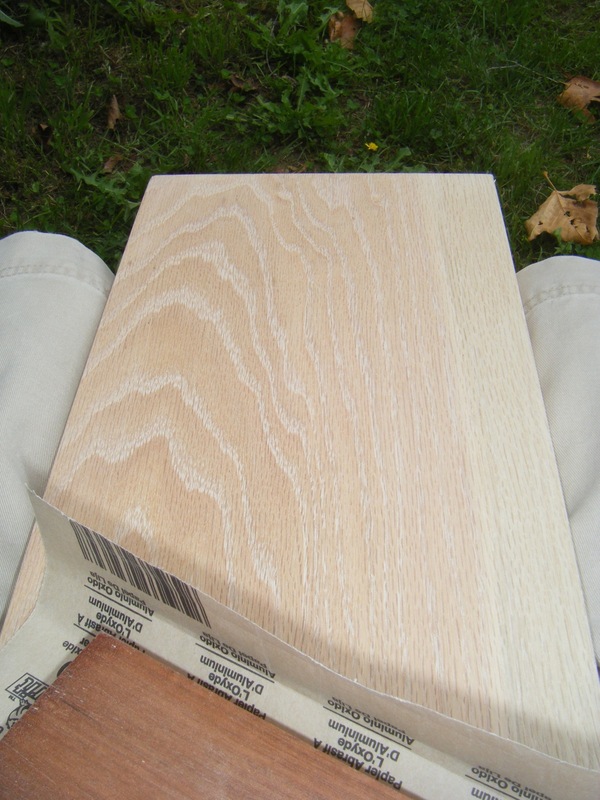 This is a white oak board; purchased today at the lumberyard and will be used to print the background. I've begun sanding it to bring out the wavy grain that should show prominently in the finished print....(or that's the idea....). More to come.